Background and aims: Recently, novel somatostatin receptor (sstr) subtype specific ligand analogues have been developed for medical treatment of neuroendocrine tumours expressing different sstrs (sstr1–5). At present, individual expression patterns of sstr subtypes are based on methods such as in situ hybridisation and polymerase chain reaction at the transcriptional level. Therefore, we generated subtype specific antibodies against sstr1, 2A, 3, and 5 and analysed their presence, cellular localisation, distribution, and expression pattern in 33 gastrinomas, 36 insulinomas, and 35 tumours associated with a carcinoid syndrome by immunohistochemistry at the translational level. Methods: Western blotting experiments were performed in the normal human pancreas used as a reference organ and in tumour tissues; at the cellular level, sstrs were localised by immunohistochemistry in tissue paraffin sections. Results: In western blot analyses, the antibodies identified the respective receptors in their correct molecular range in extracts of the pancreas and neuroendocrine tumours. Using immunohistochemistry and immunofluorescence, the antibodies specifically detected the receptors in islet cells of the normal pancreas. Immunohistochemistry in the tumours revealed that all investigated sstr subtypes were highly expressed in the different tumour types. The frequency and expression pattern of the individual sstr subtypes varied considerably not only between the different tumour types but also in each patient. Conclusions: We conclude that immunohistochemistry with subtype specific antibodies can be used in clinical routine work to analyse sstr expression patterns for each patient before treatment and to facilitate well directed individual medical therapy by administering subtype specific somatostatin analogues. We have developed a panel of sstr subtype specific antibodies to identify the presence, cellular localisation, distribution, and tumour specific expression pattern of individual sstr proteins in a panel of neuroendocrine tumours by immunohistochemistry. Such immunohistochemical analyses of sstrs in clinical routine work may be the basis for individual diagnostic and therapeutic options for patients suffering from these tumours. Neuroendocrine tumours from 33 patients with gastrinoma, 36 patients with insulinoma, and 35 patients with carcinoid syndrome (for details see table 1) were studied. The respective diagnoses were made on the presence of classical clinical symptoms (gastrinoma: peptic ulceration; insulinoma: hypoglycaemia; carcinoid tumour: severe diarrhoea and/or flush), laboratory findings, and immunohistopathological investigations (Grimelius staining, immunohistochemistry for chromogranin A, neurone specific enolase, synaptophysin, serotonin, gastrin, SS, vasoactive intestinal peptide, glucagon, insulin, and pancreatic polypeptide). In addition, some patients were subjected to SS receptor scintigraphy with [111In-DTPA-D-Phe1] octreotide. Tumour samples were obtained by surgical tumour resection performed between 1983 and 1998 at the Department of General Surgery, Philipps University, Marburg, Germany. Neoplastic tissues were resected from the centre of the respective tumours to exclude contamination with normal tissue. Normal tissue was separated beyond the tumour margins and confirmed to be histologically normal. After resection, tissues were fixed in Bouin's fixative for immunohistochemistry or immediately frozen in liquid nitrogen for western blot analyses. Pertinent data from patient histories (diagnosis, tumour location, octreoscan) are summarised in table 1. In some cases, patients were treated with octreotide but the tissues investigated in the present study were all obtained before medical treatment. Immunohistochemistry was performed in tissue specimens from the primary tumours or from liver metastases when the tumours were metastasised. Tissues were fixed for 20 hours in Bouin's fixative, dehydrated, and embedded in paraffin. The sections (5 μm) were immunostained using the avidin-biotin-peroxidase complex (ABC) technique, as detailed previously25–27: sections were dewaxed with xylene, rehydrated in a graded series of ethanol, and microwaved in 10 mM citric acid (pH 6.0) for 20 minutes at 600 W. After blocking of unspecific binding sites with 3% bovine serum albumin for 30 minutes, sections were incubated with the respective antisera (sstr antibodies 4819, 6291, 4823, and 6006, each diluted 1:500; antibodies against chromogranin A, neurone specific enolase, synaptophysin, gastrin, SS, glucagon, insulin, and pancreatic polypeptide for tumour identification were purchased from Dako (Hamburg, Germany), diluted 1:1000–1:4000; antibodies against serotonin and vasoactive intestinal peptide were purchased from Sorin (Düsseldorf, Germany), diluted 1:1000–1:10 000) overnight at 4°C, followed by incubation with biotinylated antirabbit IgG (Dako) for 30 minutes in a dilution of 1:200. The sections were then incubated for 30 minutes with a preformed complex of biotin-peroxidase/streptavidin (Dako), diluted in phosphate buffered saline (PBS) (final concentrations: biotin-peroxidase 0.7 μg/ml; streptavidin 5 μg/ml). The antigen-antibody binding sites were visualised by incubation of the sections in 0.7 mM diaminobenzidine hydrochloride/0.002% H2O2 in 0.05 M Tris HCl (pH 7.6). PBS was used as the diluent for the antisera and as a rinsing solution. Alternatively, the receptors were detected by immunofluorescence microscopy by incubation of the sections with the same sstr antibodies overnight at 4°C, followed by incubation with Cy3 labelled antirabbit IgG (Dianova, Hamburg, Germany) diluted 1:200. The immunostainings were investigated in a Zeiss Axioplan microscope equipped with appropriate filters. Although all tissue sections were treated equally (same duration of fixation, immunohistochemical protocol, and antibody dilution), significant differences were obtained in sstr expression. Tumours were categorised as negative for sstr immunoreactivity when no immunostaining was observed, even with a high power objective, despite unequivocal immunostaining for the neuroendocrine tumour markers (see above). With respect to the immunoreactivities obtained, non-specificities in the immunohistochemical protocol were excluded by running the following controls25,26: (i) omission of single steps in the immunohistochemical protocol, (ii) addition of polylysine (Mr 15 000; 2 mg/ml; Sigma) to the first antibody, and (iii) use of high molar (0.5 M) PBS as a rinsing solution between the various steps of the immunohistochemical protocol. Specificities of the antibodies were tested by preadsorption of all antisera with homologous and heterologous antigenic peptides (6.25–100 μg/ml of the antiserum).25,26 Preabsorption of the antisera with homologous antigens at concentrations as low as 6.25 μg/ml completely blocked immunostaining in the pancreatic tissues and tumours, while preadsorption of the antisera with heterologous antigens at concentrations of up to 100 μg/ml had no effect on immunostaining. Data were analysed by χ2 test for independence. Differences were considered significant at p<0.01. Human neuroendocrine tumours were identified as gastrinoma, insulinoma, and carcinoid tumours by histopathological investigations. Although some of these tumours were not of a single cell type, the respective diagnoses were made according to classical clinical symptoms of the tumours and laboratory findings. To analyse the presence, cellular localisation, and tumour specific expression patterns of the sstr subtypes in these tumours, we raised a panel of subtype specific antisera against sstr1, 2A, 3, and 5 and used them in western blotting analyses and immunohistochemistry. In western blot analyses of normal pancreatic tissues, the antibody 4819 raised against sstr1 and antibody 6006 raised against sstr5 identified the immunoreactive proteins of ∼60 and ∼65 kDa, respectively (fig 1). The antibody 6291 raised against sstr2A detected the respective immunoreactive protein in the range of ∼80 kDa molecular mass. Similarly, the antibody 4823 identified sstr3 at ∼80 and ∼45 kDa molecular mass. In addition, all sstr antibodies recognised immunoreactive proteins with identical molecular sizes in gastrinomas, insulinomas, and carcinoid tumours (fig 1). Western blot analyses of somatostatin receptor (sstr) subtypes sstr1 (A), sstr2A (B), sstr3 (C), and sstr5 (D) in normal human pancreas (lanes 1) and in pancreatic insulinoma (lanes 2) of the same patient. Note that immunoreactive sstrs of the tumour tissue comigrate with the immunoreactive sstrs of the pancreas used as the reference organ. In normal pancreatic tissues, used as positive controls, immunohistochemical and immunofluorescence investigations with the subtype selective sstr antibodies revealed strong immunoreactivity in the islet cells with a unique pattern of cellular distribution for each sstr subtype. While immunoreactivity for sstr1, 3, and 5 was detected in the cytoplasm and partly on the membrane of islet cells, clear sstr2A immunostaining was predominantly localised on the plasma membrane of the cells (figs 2, 3). Preabsorption of the antibodies with the corresponding antigens completely blocked immunostaining in the pancreatic tissues (fig 2). 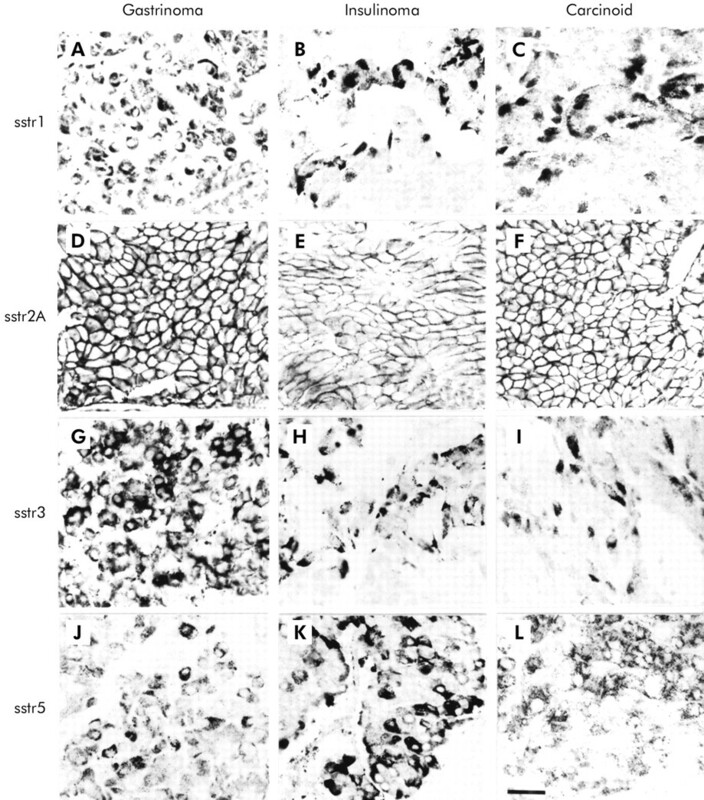 Immunohistochemistry in the neuroendocrine tumours revealed that sstr1, 2A, 3, and 5 were all highly expressed in gastrinomas, insulinomas, carcinoid tumours, and their respective liver metastases (fig 4). Although in the majority of positively stained tumours sstr immunoreactivity for the various subtypes was obtained in most tumour cells, a considerable part of the tumours showed no homogenous staining; immunoreactivity for sstrs was concentrated on groups of cell clusters in these tumours. At the cellular level, sstr2A was localised exclusively on the plasma membrane of neoplastic cells; in no case was sstr2A found in the cytoplasm (figs 4–6). 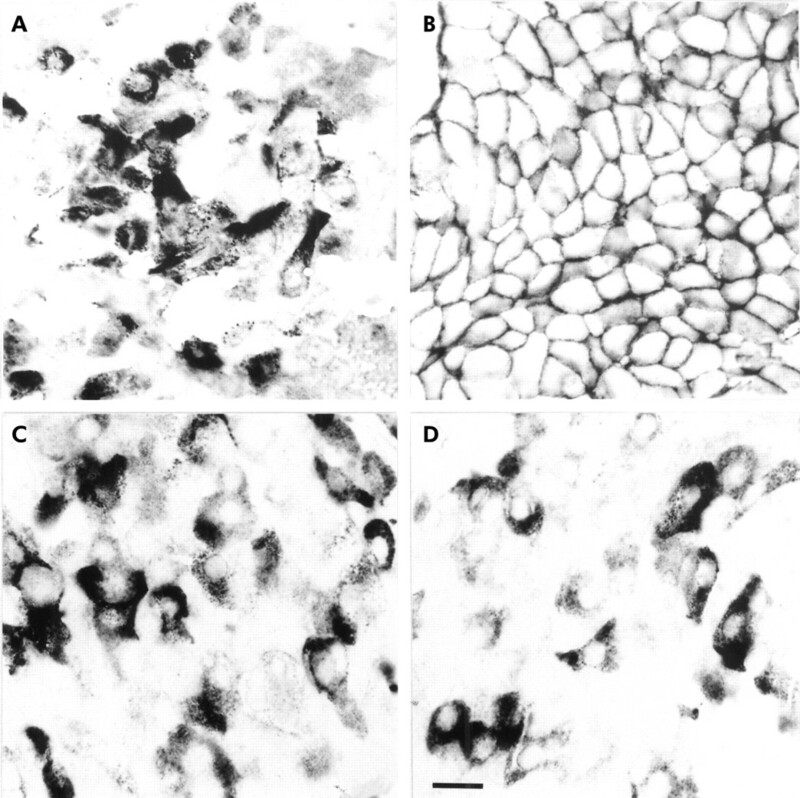 In contrast, sstr1, 3, and 5 showed immunostaining mainly in the cytoplasm (figs 4–6). Interestingly, in the different tumours, the expression pattern at the cellular level and also the frequency of receptor expression between the sstr subtypes varied greatly (table 1). While sstr1 immunoreactivity was present in 10 (30%) gastrinomas, 11 (31%) insulinomas, and 13 (37%) carcinoid tumours, sstr2A was expressed in all (100%) gastrinomas, 21 (58%) insulinomas, and 30 (86%) carcinoid tumours. Staining for sstr3 was observed in 26 (79%) gastrinomas, 28 (78%) insulinomas, and 25 (71%) carcinoid tumours; and sstr5 immunoreactivity was detected in 25 (76%) gastrinomas, 28 (78%) insulinomas, and 29 (83%) carcinoid tumours. However, with the exception of sstr2A, no significant differences were seen for the frequency of receptor expression regarding tumour type or tumour location. The sstr subtypes were present constantly in all tumour types originating from the pancreas or intestine. Regarding sstr2A, expression was by far less frequent in insulinomas than in gastrinomas or carcinoid tumours. Of 104 patients included in this study, 22 were subjected to sstr octreotide scintigraphy. Comparative analyses revealed a high correlation between scintigraphy and sstr2A immunohistochemistry; in only two cases was the outcome of sstr scintigraphy not consistent with the results of immunohistochemistry. Based on expression of SS receptors sstr2 and 5, long acting SS analogues such as octreotide, lanreotide, and RC-160, which bind to sstr2 and sstr5, have become increasingly important in the symptomatic management of patients with neuroendocrine tumours.3,10 However, a considerable part of such tumours do not respond to the current therapy.13 In this respect, the potential value of subtype specific SS analogues is under intensive discussion,14 especially as the various sstr subtypes seem to be involved in different pathways for inhibition of hormone secretion or of cell proliferation and apoptosis.10,20,21 Although the presence of sstr mRNAs has been examined in various tumours10 using costly methods such as in situ hybridisation, there are no data on the receptor status characterising the expression pattern of individual sstr subtypes in neuroendocrine tumours at the translational level. In the present study, we raised subtype specific antibodies against sstr1, 2A, 3, and 5 and analysed systematically their presence, cellular localisation, distribution, and individual expression pattern in gastrinomas, insulinomas, and carcinoid tumours by immunohistochemistry. These antibodies are specific for the respective sstr subtypes without any cross reactions. In western blot analyses of normal human pancreas known to express the various sstr subtypes,28 the sstr1 antibody 4819 and sstr5 antibody 6006 clearly identified the immunoreactive proteins in the range ∼60 and ∼65 kDa, respectively, which corresponds with the molecular mass of these subtypes.10 The antibody 6291 specifically identified sstr2A as expected at ∼80 kDa. Indeed, sstr2 in the range of 80 kDa has been reported to occur as a glycosylated form of this protein.10,29 Similarly, the sstr3 antibody 4823 identified the immunoreactive proteins at ∼80 kDa and, in addition, distinctly at ∼45 kDa molecular mass, which corresponds with that of glycosylated sstr310 and with that deduced from the respective cDNA sequence,8 respectively. Remarkably, all sstr antibodies also detected the respective proteins in tissue extracts of gastrinomas, insulinomas, and carcinoid tumours which exactly comigrated with the immunoreactive bands in the normal human pancreas. These findings indicate that the SS receptor subtypes are not only present in the pancreas, they are also highly expressed in neuroendocrine tumours. Remarkably, the different SS receptor subtypes showed different expression patterns in various tumours and even within the same tumour type (see table 1). Moreover, in five patients no immunostaining was detected for sstr1, 3, or 5; these patients expressed only the receptor sstr2A. In one case, sstr5 was present alone, and in a further two cases (insulinomas) none of the investigated sstr subtypes was expressed by the tumour cells. These findings reveal that the receptor status of patients differs considerably; one patient with a neuroendocrine tumour may express multiple sstr subtypes at the same time as an individual expression pattern and thus peculiar receptor status. Accordingly, determination of this expression pattern for each patient before treatment is of particular clinical importance. Notably, the frequency of sstr expression varied significantly between the different sstr subtypes and for sstr2A also between the different tumour types. While sstr2A was present in 86% of carcinoid tumours and even in 100% of gastrinomas, it was detected in only 58% of insulinomas. As 50% of insulinomas do not respond to octreotide treatment, as shown previously,20,32 the absence of sstr2A in these patients may explain the lack of any pharmacological effect of this drug binding predominantly to the receptor subtype 2. In contrast, more than 90% of gastrinomas responded adequately, improving clinical symptoms when treated with octreotide,13 confirming the high expression rate of sstr2A in this tumour type. In conclusion, many patients suffering from neuroendocrine tumours lack any response to octreotide therapy. But in patients with negative octreotide scintigraphy, iodinated SS itself (SS-14 or SS-28) was shown to specifically bind to SS receptors.33,34 This differential binding between octreotide and SS-14/SS-28 ligands in these patients suggests that octreotide does not bind to all sstr subtypes and that new sstr subtype selective analogues should be created for the treatment of patients with tumours expressing sstr of this particular subtype. Indeed, highly specific analogues for the respective sstr subtypes were developed very recently to achieve more effective pharmacotherapy.35 As the present study showed, sstr subtype specific antibodies may be used in clinical routine work to determine individual SS receptor status for each patient before treatment. As expression of individual sstr subtypes varies in different tumour types and even in each patient, immunohistochemical determination of these receptors is of particular clinical importance for well directed individual planning of medical treatment. Future studies should analyse the outcome of SS analogue therapy in relation to the density of respective sstrs determined by immunohistochemistry. We thank Mrs D Bonorden (Department of Gastroenterology, Philipps University, Marburg) for her expert technical assistance and Mrs I Böddeker (Institute for Medical Biometry and Epidemiology, Philipps University, Marburg) for statistical calculations. This study was supported by the Research Pool of the Philipps University Marburg, grant SCHU 924/4-1 (SS), from the Deutsche Forschungsgemeinschaft, and grant QRTL-1999-00908 (SS) from the European Commission. Jensen R. Pancreatic endocrine tumors: Recent advances. Ann Oncol1999;10:S170–6. Öberg K. Neuroendocrine gastrointestinal tumors—a condensed overview of diagnosis and treatment. Ann Oncol1999;10:S3–8. Arnold R, Trautmann ME, Creutzfeldt W, et al. Somatostatin analogue octreotide and inhibition of tumour growth in metastatic endocrine gastroenteropancreatic tumours. Gut1996;38:430–8. van Eijck CHJ, de Jong M, Breeman WAP, et al. Somatostatin receptor imaging and therapy of pancreatic endocrine tumors. Ann Oncol1999;10:S177–81. Reubi JC, Kvols LK, Waser B, et al. Detection of somatostatin receptors in surgical and percutaneous needle biopsy samples of carcinoids and islet cell carcinomas. Cancer Res1990;50:5969–77. Krenning EP, Kwekkeboom DJ, Bakker WH, et al. Somatostatin receptor scintigraphy with [111In-DTPA-D-Phe1] and [123Tyr3] octreotide. The Rotterdam experience with more than 1000 patients. Eur J Nucl Med1993;20:16–731. Yamada Y, Post SR, Wang K, et al. Cloning and functional characterization of a family of human and mouse somatostatin receptors expressed in brain, gastrointestinal tract, and kidney. Proc Natl Acad Sci USA1992; 89:251–5. Yamada Y, Reisine T, Law SF, et al. Somatostatin receptors, an expanding gene family: Cloning and functional characterization of human SSTR3, a protein coupled to adenylate cyclase. Mol Endocrinol1992;6:2136–42. Panetta R, Greenwood MT, Warszynska A, et al. Molecular cloning, functional characterization, and chromosomal localization of a human somatostatin receptor (somatostatin receptor type 5) with preferential affinity for somatostatin-28. Mol Pharmacol1994;45:417–27. Patel YC. Somatostatin and its receptor family. Frontiers Neuroendocrinol1999;20:157–98. Reisine T, Bell GI. Molecular biology of somatostatin receptors. Endocrine Rev1995;16:427–42. Lamberts SWJ, Krenning EP, Reubi JC. The role of somatostatin and its analogs in the diagnosis and treatment of tumors. Endocrinol Rev1991;12:450–82. Eriksson B, Öberg K. Summing up 15 years of somatostatin analog therapy in neuroendocrine tumors: Future outlook. Ann Oncol1999;10:S31–8. Hofland LJ, Lamberts SWJ. Somatostatin analogs and receptors. Diagnostic and therapeutic applications. In: Andrew A, ed. Endocrine neoplasms. Amsterdam: Kluwer Acadamic Publishers, 1997;163–76. Arnold R, Frank M. Gastrointestinal endocrine tumours: medical management. Baillieres Clin Gastroenterol1996;10:737–59. Lamberts SWJ, Hofland LJ, van Koetsveld PM, et al. Parallel in vivo and in vitro detection of functional somatostatin receptors in human endocrine pancreatic tumors: consequences with regard to diagnosis, localization, and therapy. 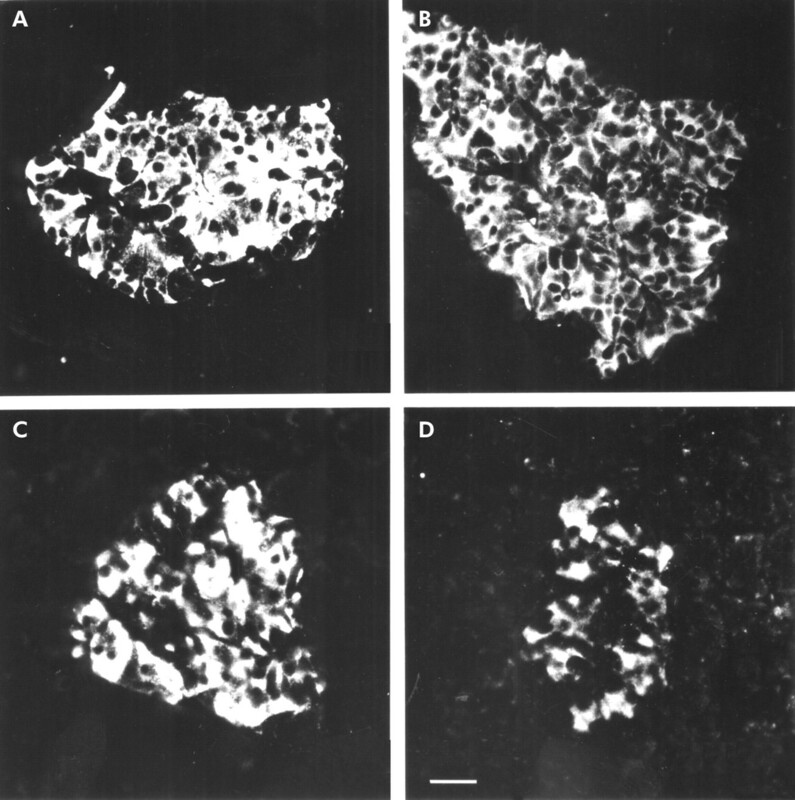 J Clin Endocrinol Metab1990;71:566–74. Janson ET, Stridsberg M, Gobl A, et al. Determination of somatostatin receptor subtype 2 in carcinoid tumors by immunohistochemical investigation with somatostatin receptor subtype 2 antibodies. Cancer Res1998;58:2375–78. Hofland LJ, Liu Q, van Koetsveld PM, et al. Immunohistochemical detection of somatostatin receptor subtypes sst1 and sst2A in human somatostatin receptor positive tumors. J Clin Endocrinol Metab1999;84:775–80. Reubi JC, Kappeler A, Waser B, et al. Immunohistochemical localization of somatostatin receptors sst2A in human tumors. Am J Pathol1998;153:233–45. Sharma K, Patel YC, Srikant CB. Subtype-selective induction of wild-type p53 and apoptosis, but not cell cycle arrest, by human somatostatin receptor 3. Mol Endocrinol1996;10:1688–96. Schulz S, Schulz S, Schmitt J, et al. Immunocytochemical detection of somatostatin receptors sst1, sst2A, sst2B, and sst3 in paraffin-embedded breast cancer tissue using subtype-specific antibodies. Clin Cancer Res1998;4:2047–52. Schulz S, Pault SU, Schulz S, et al. Immunohistochemical determination of five somatostatin receptors in meningeoma reveals frequent overexpression of somatostatin receptor subtype 2A. Clin Cancer Res2000;6:1865–74. Schulz S, Schreff M, Schmidt H, et al. Immunocytochemical localization of somatostatin receptor sst2A in the spinal cord and dorsal root ganglia. Eur J Neurosci1998;10:3700–8. Cetin Y, Kuhn M, Kulaksiz H, et al. Enterochromaffin cells of the digestive system: Cellular source of guanylin, a guanylate cyclase-activating peptide. Proc Natl Acad Sci USA1994;91:2935–9. Cetin Y, Kulaksiz H, Redecker P, et al. 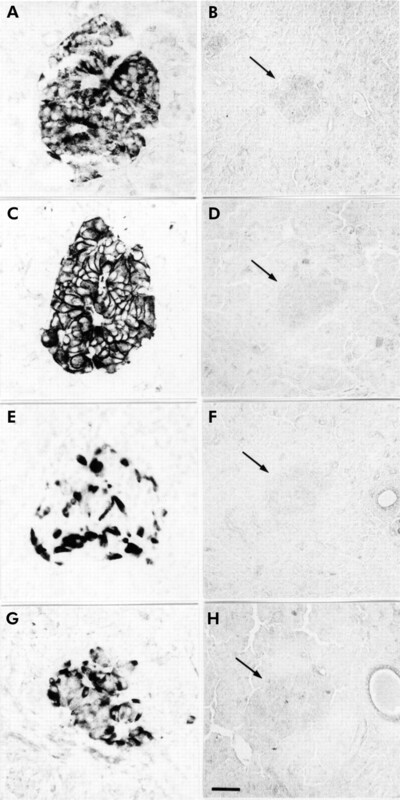 Bronchiolar nonciliated secretory (Clara) cells: Source of guanylin in the mammalian lung. Proc Natl Acad Sci USA1995;92:5925–9. Kulaksiz H, Arnold R, Göke B, et al. Expression and cell-specific localization of the cholecystokinin B/gastrin receptor in the human stomach. Cell Tissue Res2000;299:289–98. Kumar U, Sasi R, Suresh S, et al. Subtype-selective expression of the five somatostatin receptors (hSSTR1–5) in human pancreatic islet cells. Diabetes1999;48:77–85. Schonbrunn A. Somatostatin receptors present knowledge and future directions. Ann Oncol1999;10:S17–21. Koerker DJ, Ruch W, Chideckel E, et al. Somatostatin: hypothalamic inhibitor of the endocrine pancreas. Science1974;184:482–3. Kimura N, Pilichowska M, Date F, et al. 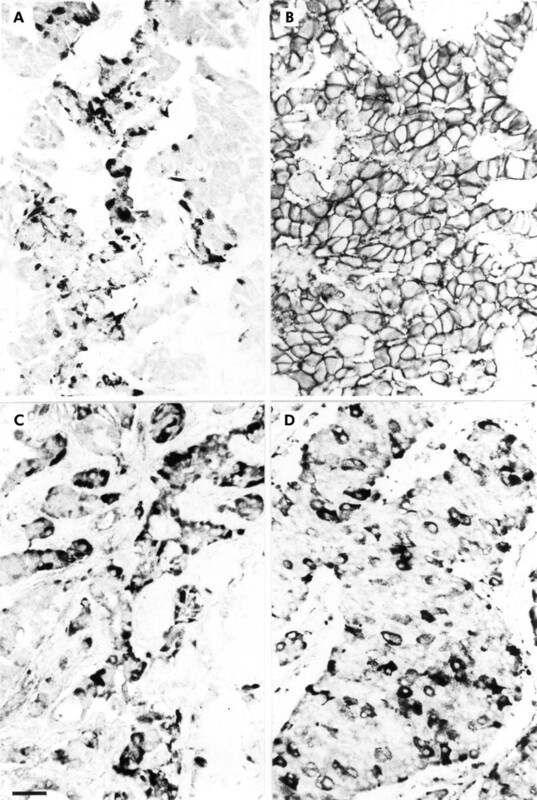 Immunohistochemical expression of somatostatin type 2A receptor in neuroendocrine tumors. Clin Cancer Res1999;5:3483–7. Scarpignato C. Somatostatin analogues in the management of endocrine tumors of the pancreas. In: Mignon M, Jensen RT, eds. Endocrine tumors of the pancreas. Basel: Karger, 1995;385–414. Reubi JC, Laissue J, Krenning E, et al. Somatostatin receptors in human cancer: Incidence, characteristics, functional correlates and clinical implications. J Steroid Biochem Mol Biol1992;43:27–35. Reubi JC, Krenning E, Lamberts SWJ, et al. In vitro detection of somatostatin receptors in human tumors. Metabolism1992;41:104–10. Rohrer SP, Birzin ET, Mosley RT, et al. Rapid identification of subtype-selective agonists of the somatostatin receptor through combinatorial chemistry. Science1998;282:737–40.